For four years, MLB has exploited all the in-season holidays – Memorial Day, July 4th, Labor Day – plus on many occasions 9/11, by having all players wear special caps. Today, caps with an American flag patch stitched on the back, to the left of the inviolable MLB logo, were worn by all clubs and all players. So, in New York, where in 2001 first the Mets and then the Yankees honored the fallen members of – and the heroic and selfless acts of – the New York Police Department, the New York Fire Department, New York EMS, Port Authority Police, New York Sanitation, and several others by wearing their caps during the games of the weeks after the attacks, Major League Baseball denied the Mets the opportunity to wear those caps again, just for tonight’s anniversary game, the only one being played within a thirty minute ride to the World Trade Center. According to team Player Representative Josh Thole, the Mets players debated violating the dictum and wearing them anyway. Thole told reporters shortly thereafter that the league was adamant and it was a “no-go.” It is meaningful to realize that only three current Mets were even in the majors a decade ago: Miguel Batista, Willie Harris, and Jason Isringhausen. Evidently the Commissioner’s representative reminded them that the punishment – a heavy fine – would be meted out on ownership, not them (and for all we know, a major fine might cause this team to go out of business before noon tomorrow). For his part, David Wright wore a Police cap on the bench, but even he resisted the temptation to wear it on the field and incur the wrath of the Bean Counters in the Commissioner’s Office. Those bloodless MLB individuals have been down this path before. Ten years ago, Bud Selig’s initially ruled the Mets and Yankees could not wear the caps during games. The Mets ignored the threat, and MLB decided to give them a pass for a game or two, and then the Mets kept wearing them, and MLB wisely backed off their nonsensical decision. Tonight’s ruling reminded everybody that at the moment of the nation’s greatest grief, MLB’s money-making instinct was unhindered by the blood and destruction and fear. At least in 2001 the sport was smart enough to shut up. Not this year. MLB first blocked the Washington Nationals from wearing military caps in tribute after a disaster in Afghanistan last month. Then came this decision, complete with in the kind of stupidity that would make a megalomaniac proud: they blamed it on MLB Vice President Joe Torre, the native New Yorker who wore these caps at the end of the 2001 season. So if it hadn’t been shameful already, pinning it on Torre made it doubly shameful. As an aside, I should note that I actually got a tweet from an idiot who wondered why I thought wearing the NYPD/NYFD/PAPD/EMS caps was somehow “patriotic.” It never crossed my mind. It has nothing to do with patriotism. 343 firefighters and paramedics died that day. 23 New York policemen did. And 47 from the Port Authority Police. This is about remembering them – and acknowledging what all those who survived did for this city and the wounds they still have. For me, as the grandson of a New York fireman, and the descendant of several others, and many NYPD and regional PD, this is something deeper than patriotism. CitiField is, of course, ringed with commemorations and in particular the “We Shall Not Forget” logo placed in the ad right behind the batter’s box. And it has all been rendered utterly hollow because of the crassness of the decision about the NYPD/FD/EMS caps. If you still haven’t figured out why MLB is permitting this public relations disaster to happen; why Commissioner Bud Selig didn’t get on the phone and tell the Mets they could wear those caps right away and damn the consequences, the answer is to be found here. In case you don’t want to follow the link, here’s your answer: this is available as of tonight directly from MLB for just $36.99. 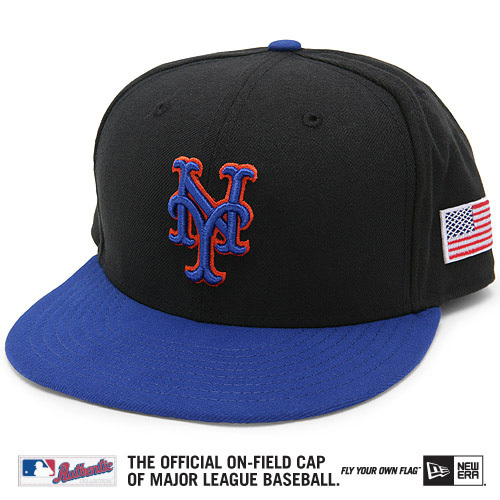 I guess we should be happy it has an American flag, and that MLB just didn’t sell the space to the highest bidder. The most telling observations off Twitter yesterday: The colored-in beard sticking out from Brian Wilson of the Giants makes him look either like Bluto from Popeye or Bill Murray playing Hercules (“That boulder is too large. I could lift a smaller one”) on Saturday Night Live. Absolutely fitting news from college football. Brian Jordan did color on a telecast of the Memphis-Southern Mississippi game yesterday. He spent the baseball season doing color on the telecasts of the AAA Gwinnett Braves, and a handful of broadcasts for the big league club. The former two-sport player is now a two-sport announcer. My review of Jane Leavy‘s marvelous Mickey Mantle biography is now online at the Sunday New York Times Book Review. However, if you go to the editors’ notes in the front you will read a story about me, but apparently featuring an illustration meant to look like British Foreign Secretary William Hague if he had glasses and a little hair. Impressive, no, that in three games of League Championship play we have already seen CC Sabathia, Tim Lincecum, and Roy Halladay, and none of them have been sharp enough to write home to Mother about. Doesn’t exactly set the bar high for Cliff Lee tomorrow night in New York. 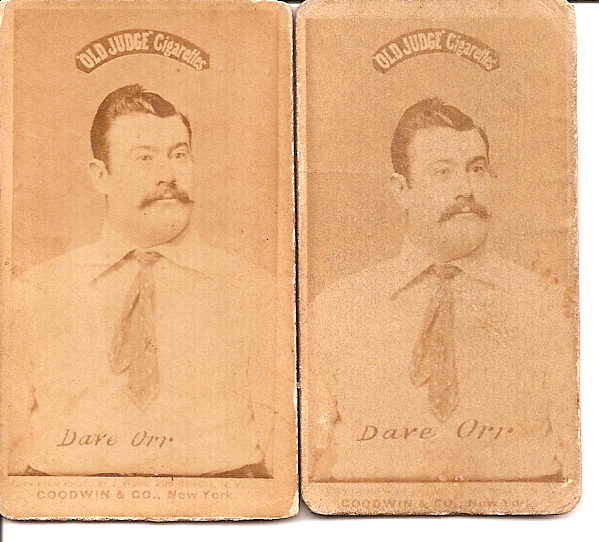 Finally, if you want to try to understand some of the joy of antique baseball cards, consider late breaking news from the first comprehensive set ever issued, the 1887-1890 sets put out by Old Judge Cigarettes. 512 players were shown, in well over 2000 different poses (New York Giants outfielder Mike Dorgan had 17 different), with an almost incalculable number of caption and team variations, in transcendent photographs in which baseballs were often hung by string from the ceiling of the photographer’s studio. And two new variations were discovered yesterday. One of the most-collected parts of the series is a subset of 16 players from the original New York Mets of the then-major league American Association. The cards were put out early in 1887, when the Mets played on Staten Island, more or less exactly where the current ballpark for the Yankees’ affiliate now stands. The fellow who owned the then-private Staten Island Ferry bought the club and put up a ballpark next to his Wild West show and outdoor theater in hopes of drumming up business to Staten Island. It didn’t work and the Mets wound up moving to Kansas City in 1888. 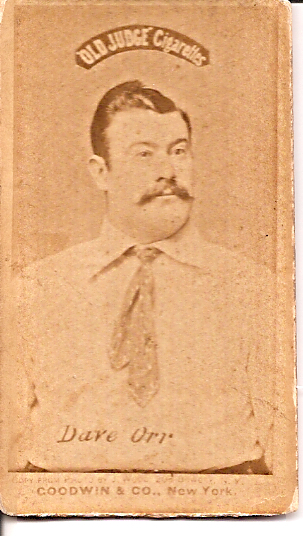 The players are all inexplicably shown wearing the same kind (maybe even just the same one) spotted cravat tie and are thus known as “Spotted Ties.” The card shown here is of Mets’ first baseman Dave Orr, one of the few sluggers of the time and a genuine Hall of Fame candidate despite a career cut short by a stroke after just eight seasons. way all Dave Orr Spotted Ties looked. Then Jay emailed me yesterday to say that a minor variation had been noticed in the card of Mets’ catcher Charlie Reipschlager (identified on the card and in the box scores of the day as “Ripslager”). It was simply how the name “Ripslager” was lettered across his uniform. 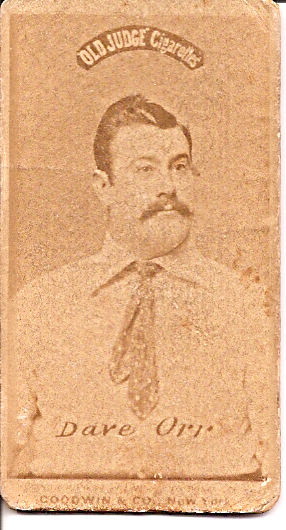 It was clear that it had been re-done for some reason, possibly owing to the mechanical process by which the original photographs of the players were re-photographed using the big box cameras of the day, to creete one large photograph from which the sheets of cards were printed. in any event, Jay suggested I should check the Ripslager card in my collection (and the other “Spotted Ties”) for the variation. I didn’t have the two different versions of the catcher, but lo and behold, there are at least two different versions of Orr. This second card on the left shows a larger, bolder identification, the letters nearly touching the tie, and far more spread out. y new pose of Jim Tyng (inventor of the catcher’s mask) was discovered just last year, not long after we had all realized that the “only” card of Baltimore manager Billy Barnie was actually two different photos, taken within seconds of each other, and showed only a slight change in where his gaze was directed, and a previously unknown player, Whitey Gibson, was only unearthed in 1980. And thus the charm of collecting: we’re still getting new cards, 113 years after Goodwin & Co. first made them.